Rosa Parks and Jeanne Theoharis, author of the first scholarly biography of the civil rights legend. Nonviolence as a tool of social change has often been underestimated and misunderstood. The British thought Gandhi was nuts when he predicted they would simply pick up and leave India without the Indians firing a shot. Black militants sneered at Martin Luther King’s program of nonviolent direct action. And many southern whites assumed African Americans were too undisciplined to collectively turn the other cheek. Or they reasoned curiously that King’s approach was actually violent because it provoked violence in response. 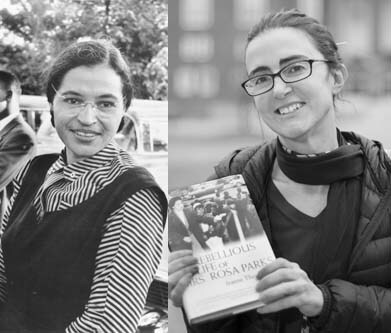 During this Black History Month, new questions about nonviolence and the Civil Rights Movement have bubbled up, thanks to an important new book, The Rebellious Life of Mrs. Rosa Parks (Beacon Press), by Brooklyn College political scientist Jeanne Theoharis. Her subject is the presumably quiet, unassuming seamstress who refused to surrender her seat on a bus to a white passenger because her feet were tired. But aside from her act of resistance, Parks was not that person, according to Theoharis. For one thing, Parks often dismissed the fabled narrative about how she remained seated because of her tired feet. “I didn’t move, because I was tired of being pushed around,” she clarified. As Theoharis shows, black radicalism ran deeply in her family, and she came to sympathize with the Black Power movement that challenged King’s ethic of love and nonviolence. This storied figure of nonviolent struggle always believed in what she called “self protection.” Like most blacks at the time (including King, very early in the movement), Parks and her husband owned guns. But once the Montgomery Bus Boycott began, she knew many whites were wishing it would turn violent. That would give them “an excuse to dramatically crush the protest,” Theoharis relates. For her, collective power could be found in organized nonviolence, while self-respect, at times, required self-defense: “As far back as I remember, I could never think in terms of accepting physical abuse without some form of retaliation if possible”…. Parks saw nonviolent direct action and self-defense as interlinked, both key to achieving black rights and maintaining black dignity. Still, she felt that nonviolent resistance during the bus boycott served as a rebuke to white citizens who regarded blacks as too feckless and “emotional” to carry out such a disciplined strategy. “Parks had delighted in the power of it,” her biographer writes. Dr. King was criticized because he tried to bring about change through the nonviolent movement. It didn’t accomplish what it should have because the white establishment would not accept his philosophy of nonviolence and respond to it positively. When the resistance grew, it created a hostility and bitterness among the younger people, who worked with him in the early days, when there was some hope that change could be accomplished through his means. This sounds just a little odd to me—as though all hope of racial justice and equality was quickly dashed. There certainly was and remains much unfinished work. But in view of the remarkable social change that took place during the King years, you have to wonder: If he wasn’t successful in effecting change, then who was? But does this compelling biography demand a larger retelling of the role of nonviolence in the Civil Rights Movement? Not really. In the spring of 1963, African American children were laying their little bodies on the line in Birmingham, Alabama. 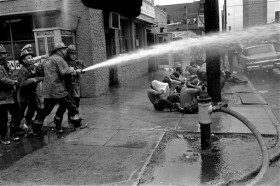 Thousands of them, as young as six years old, strode out of schoolhouses to join in the marching downtown—several times during one of the most chaotic and brutal episodes of the civil rights movement. We must say to our white brothers all over the South who try to keep us down: We will meet your physical force with soul force. We will not hate you…. Do to us what you will. Threaten our children and we will still love you…. Bomb our homes and go by our churches early in the morning and bomb them if you please, and we will still love you. Before King came along, the theme had kicked around Protestant theology for decades, more or less as a shibboleth of theological optimism. King gave the idea a certain soberness, and as University of Virginia theologian Charles Marsh notes, he infused it with moral urgency. In his hands, the beloved community became the “realization of divine love in lived social relation,” in Marsh’s words—never fully realized but always an object of human striving. Marsh (his 2005 book is The Beloved Community: How Faith Shapes Social Justice, from the Civil Rights Movement to Today) and other writers have shown how the motif threaded through King’s writings and speeches until the end. It gave the freedom struggle its theological trajectory. King had rooted the principle partly in what he considered a fact of human existence, that we are social by nature, interdependent with one another. “The solidarity of the human family” were words he frequently spoke in this vein, Kenneth L. Smith and Ira G. Zep observed in their 1974 book Search for the Beloved Community. He could see the obstacles ahead. While battling legal segregation, King contemplated a future, subtler enemy: “spiritual segregation,” the mistrust and distance between blacks and whites that would continue to forestall a beloved community. Not even racial harmony would usher in the great community, in his mind (as he made clear in his 1967 book Where Do We Go From Here: Chaos or Community?). A further requirement was economic justice, a bridging of chasms between rich and poor. Earlier this month, the Brookings Institution and the Public Religion Research Institute released the results of an opinion poll casting light on simmering resentments in the body politic. For instance, a (slim) majority of white Americans polled—51 percent—agreed with the statement, “Today discrimination against whites has become as big a problem as discrimination against blacks and other minorities.” Among those who say Fox News is their most trusted source of information, 70 percent held the same view. What lies behind this myopia might be hard to pinpoint. Economic anxiety? An African American president? Recollections of purely race-based affirmative action? Or simply, the unrealized dream of a beloved community. King himself seemed to think this community would always be not yet. At times he made it sound like a spiritual construct to be made flesh in the Kingdom of God. He also wielded the phrase when preaching about the endless struggle against evil, in which God ultimately prevails, as Smith and Zepp pointed out. Less cosmically, King had faith in the human capacity to approximate the beloved community, here and now. He saw the civil rights movement, spanning racial lines, as a microcosm of the ideal. Where are the signs of such approximation today? Earlier this year the New York Times ran an eye-opening series titled “Race Remixed,” which explored interracial marriage and the growing numbers of mixed-race Americans. Surely this is a mark of spiritual integration. Beyond race, polls for over two decades have shown that lopsided majorities of Americans favor higher minimum wages for the poorest workers. Whatever one might think of the wisdom of such a proposal, the impulse is a moral one. It’s an instance of social solidarity, not economic self-interest. Boosting the bottom wage would give no direct lift to most wage earners.